India, (3/12/2018): “We thank Prime Minister Sh. Narender Modi for 12 key announcements made before Diwali and request Mr. Vipul Goel, Industry Minister Haryana to monitor its implementation in 100 days”, said Mr. J.P. Malhotra President DLF Industries Association in his welcome address at 7th DLF Business Summit–2018. The theme of this summit was “Ease of Doing Business & Economic Reforms – Impact on MSMEs”. Attended by galaxy of Industry entrepreneurs from Faridabad in which representative of other trade organisations of Faridabad and NCR also participated. Chief Guest of the evening DCP Faridabad Mr. Vikram Kapoor thanked the industries of Faridabad for supporting police department by giving them vehicles for patrolling all around the city. He addressed by, Sh. P. Udayakumar Director NSIC, and Dr. S.S. Acharya GM SIDBI Delhi Region. Presentations were made by Sh. P.S. Manoj SIDBI Dy. GM, Foundation for MSME Clusters joined by YES Bank Dy. GM Danish and Prabhjot Kaur. Apart from the above said speakers, representative from RS4U also show a presentation to apprise of the gathering about the services they are offering. He stressed upon identifying the gaps in the supply chain process of the organization and outsourcing of the pain areas. He said that smoothening of supply chain management actually leads to “Ease of Doing Business”. Mr. J.P. Malhotra announced that DLF Industries Association will set up an Export Facilitation Centre to help MSME’s. The services would be available at reasonable cost and engage in hassle free work thus augmenting ease of doing business. Dr. S. S. Acharya GM SIDBI, while sharing the facilities they are offering to MSME, assured that credit to small enterprises through MUDRA, SMILE start up stand up flagship schemes & recent announcements of 59 PSB Loans are already showing results. Responding to Mr. J.P. Malhotra’s request for collateral free credit at lower cost as well as processing of the same in fastest mode, Dr. S.S. Acharya said that SIDBI is geared to help MSMEs because they form the backbone of growth story of India. Sh. H.K. Batra President of Faridabad Chamber of Commerce & Industry for “Promoting Ease of Doing Business for MSMEs and Facilitating Contact with Govt. of Haryana through District and State Officials”, Rotarian CA Vinay Bhatia – District Governor 2018-19 of Rotary International for “Promoting T.E.A.C.H. & Sanitation in Schools Environment Protection & Disease Prevention Blood Donation. A large number of young entrepreneurs and Next Generation employers of Senior industrialists of Faridabad were specially invited in the summit. Mr. J.P. Malhotra welcomed and motivated them to be present to meet and great their pears and seniors in the Industry besides interact with proven leaders of Industry. Some of them were Kuna Kohli, Angad Singh, Rohit Rungta, Priyata Raghavan, Charu Smita Malhotra, Nikunj Aggarwal, Dhruv Batra, Raj Bhatia, Deepak Prasad, Mandhir Singh, Gaurav Malhotra, Bhavya Gupta and Rajesh Kapoor, to name a few. 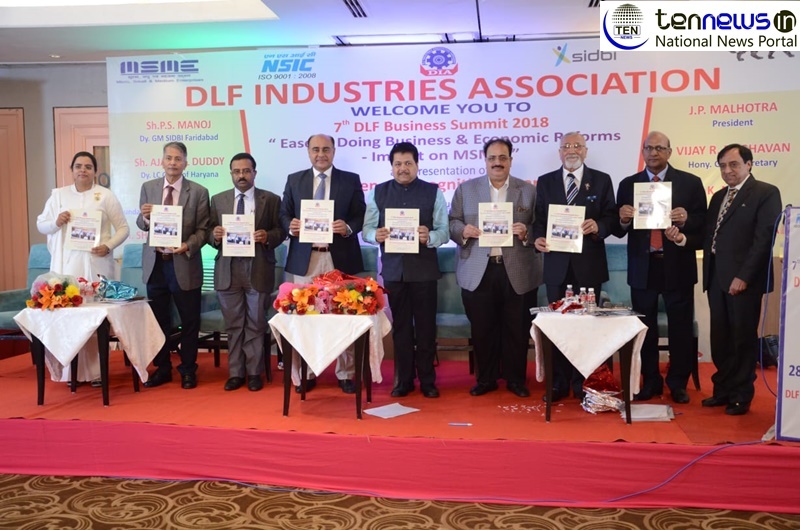 7th DLF Business Summit – 2018 was attended by more than 175 Industry representatives. Representatives from other trade organisations were also present. Some of these are President FCCI Sh. H.K. Batra, District President Laghu Udyog Bharti Sh. Ravi Bhushan Khatri, Sh. Subhash Chander representing Industries Assocation IMT Faridabad, Sanjay Wadhawan from HSIIDC Sector-31, H.L. Bhutani and A.N. Sharma representing – HSPC, Mukesh Kalra from FISME, Ravi Vesdev – Haryana Chamber of Commerce besides Sh. Arun Bajaj from Laghu Udyog Bharti, Sh. Ramesh Jhawar former president Faridabad Chamber of Commerce and Industry along with others. Yami Gautam Unveils Max Fashion’s 250th store In National Capital!